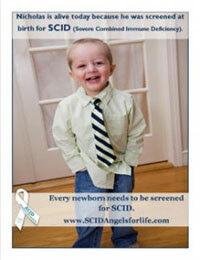 SCID Newborn Screening has made quite an impact lately in the news. Click on the map to enlarge the image and see the number of conditions that are screened for in your state. To see a list of the current conditions that are screened for by each state click here Current Conditions.